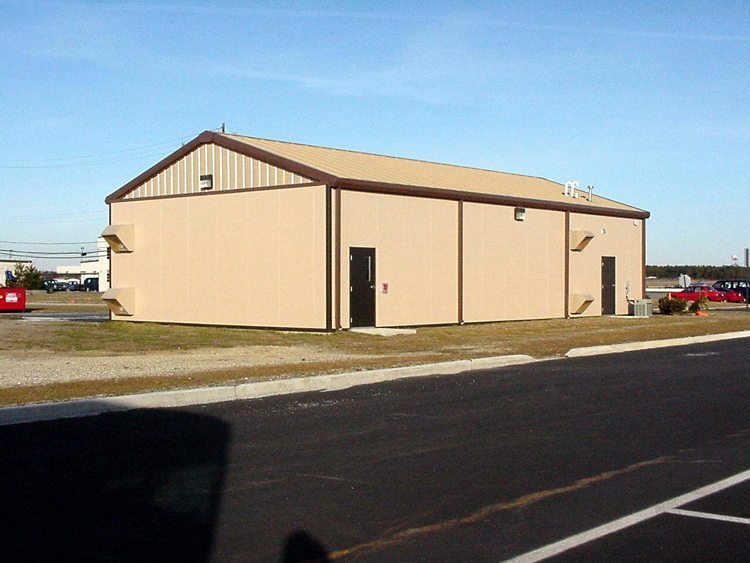 Prefabricated metal buildings have a wide array of uses. These uses include being enclosures for equipment, tools, and other large items to an alternative to modular training facilities. Because of their versatility in reference to size and structure, metal buildings can be storage structures for any heavy equipment. They have a steel base that keeps them structurally sound no matter what type of equipment or tools they are housing. As an alternative to a modular training facility, metal buildings offer aesthetic benefits, being more attractive than having a mobile home sitting in a school or office parking lot. They also offer more size options to accommodate more people and classroom type furniture. These buildings are easy to relocate using a crane or forklift. The wall panels of a prefabricated metal building offers options in the style of siding used and the color preferred by the end user. A ribbed pattern or a stucco like appearance are options for the siding type, and colors range from muted earth tones to lighter non-descript colors to bright eye catching hues. The wall panels of a metal building are the first thing that an end user and client will notice and there are a wide variety of options in texture and color. Prefabricated metal buildings are constructed to be expandable; this turns it into an investment. With the ability to change in size, metal buildings can be useful even after their initial purpose has been served. They are perfect for a job at a remote location and can later be expanded to serve a purpose at another location or as a storage facility at a permanent location. Through the years, building code requirements have become more and more strict. Fire codes and structural codes need to be met even for temporary structures and metal buildings. The buildings are capable of meeting even the toughest of building codes in any location. They are designed to meet OSHA regulations on sound and ASTM regulations on fire safety. All structures and construction will be built to meet or exceed building code standards. Roof panels are stucco-embossed aluminum and are weather tight and easy to install with different roof and ceiling panels available. Wall panels are available in aluminum and vinyl, or ceramic steel. They are designed to withstand exposure to the elements. Earthquake and hurricane resistant exteriors can be combined with interiors designed to withstand hard manufacturing environments. Metal building prices can depend on the type of siding and interior walls chosen but there are economical and visually pleasing options that are durable and safe. Wall partitions are available for when a metal building is used as an office environment. They are designed to meet requirements for fire codes and sound control. The vinyl walls will never need to be repainted and provide privacy for office staff or light duty machinery. They are slightly flexible for ease of installation. The beauty of prefabricated metal buildings is that they can be designed to fit a variety of needs. They are available as multi-story office buildings, and because of the ease of expansion, they meet the needs of growing companies. They are structurally sound enough to be used as a plant with heavy machinery and also have the space for office areas and storage. Insulation options are available for fire and sound control. Prefabricated buildings such as these conserve space by using a second story as a viewing deck for the plant facilities or modular offices. Environmentally controlled rooms are even an option in these prefabricated buildings. Metal building construction is often preferred to traditional construction because of the decreased lead and installation time. From the drawing board where the design is made, the building is prefabricated and will be shipped to the job site in as little as five days, depending upon the size of the building. Due to the ease of construction of these buildings versus the time consuming construction of traditional buildings, metal buildings are preferred when a job needs to be completed in a hurry. Most buildings can be constructed and completed on site in about a week’s time; again, this is dependent upon the size of the building. For custom buildings, metal building prices can vary depending upon the need of the consumer. All designs and options are at the discretion of the buyer. Beyond the appearance of the building is the materials used in the wall and roof panels and ceiling. Interior walls are optional, but also come with their own set of options. From office space to a warehouse space and production facilities, custom designs can incorporate anything that a consumer might need.